Stephen R. Covey dies at the age of 79. He was one of my favorite authors. 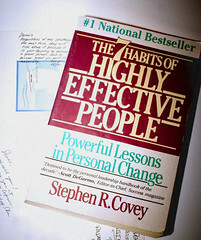 I am sure you have heard of “7 Habits of Highly Effective People”. A book everyone should have on their shelve’s. I was extremely shocked to hear that Stephen Covey would not make a full recovery from his bicycle accident. The cause was complications from injuries sustained in a bicycle accident, said Debra Lund, a spokeswoman for the Utah-based FranklinCovey leadership training and consulting company he co-founded. In April, Covey lost control of his bike while riding down a hill in Provo, Utah. He was hospitalized for two months with a head injury, cracked ribs and a partly collapsed lung but “never fully recovered,” Lund said Monday.